One PFS design "flaw" (intentional or not), made it impossible to connect the PF IR Receiver to any old 9V source by simple using any of the PF Extension Wires (8886, 8871). Thus several workarounds have been proposed and this was already discussed here at TBs before [1, 2]. From powering the IR Receiver from one of its outputs, to use an empty PB battery box there is always a solution that most fits your needs. However these days while preparing a post still to come, I found the most compact workaround and probably the most interesting one. I've seen it being used in a mini tank MOC [3*, 4], by Jaeho Jung from BrickInside (the largest LUG in South Korea). According to Jaeho Jung, this is a method developed by Minshik Kong, aka Sarafiel [5, 6] (another BrickInside member). The method explanation itself, can be found here* (you should be able to recognize the first video there ). 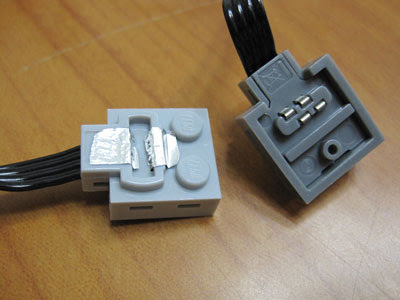 In simple words, the method consists of using a thin aluminum foil to short-circuit the 9V/C1 and 0V/C2 pins on the PF lead that connects with the legacy 9V source, via any 9V/PF adapter/extension cable. I'm sure the images below, from Philo's 'Power Functions™ Presentation' webpage, will help you to understand the principles behind this idea. Simple, brilliant and no bulky or limiting solutions, I would say! *) All the links with reviews and uses of this method, are written in Korean but hopefully the photos seapk by themselves. I know 'philohome' show PF internal. So I do some test and I can run 9v box to PF IR receiver. 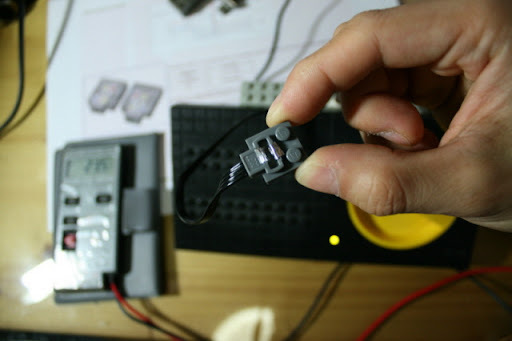 It is very easy, simple and not cutting or soldering LEGO. Just use some Cooking foil !! Hi Sarafiel, good to see you here! Very clever your method, indeed! Indeed, most clever: even though it uses non-LEGO elements (the tin foil), they're well hidden and the overall appearance remains pure LEGO! Great! In fact, I think this exactly what the PF battery box does, only with all the extra bulk of the battery holder and the switch. I guess you need to check polarity/direction of connector such that you have +9V on C1 and -9V on C2? 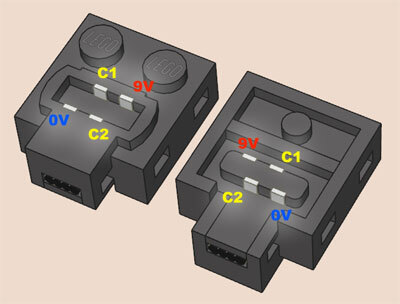 What will happen if you send -9V on the +9V line - will the receiver just not work or will it become destroyed? Hi, I'm Jaeho Jung, designer of the mini Tank. If the polarity is reversed as a mistake, the receiver just does not work. It is not destroyed. Designing the mini Tank, I tested several times with 9V battery box and the receiver. 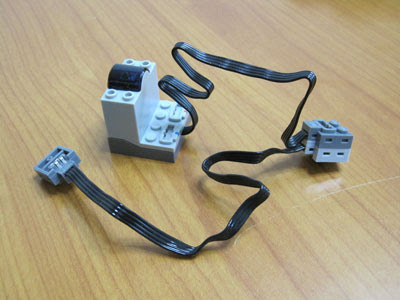 But, sarafiel cautioned that this is not original LEGO usage and so safety is not guaranteed for a long time of connection like this. At least, my model and receiver is OK for 2 months from creation till now.